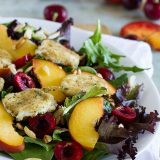 The perfect combination of sweet and savory, this Stone Fruit Salad with Fried Goat Cheese takes advantage of summer peaches and cherries and combines them with fried goat cheese coins that you’ll want to add to every salad. Such a great summer salad! Combine the almonds and sugar in a small sauté pan. Set over medium heat and stir constantly until the sugar is melted and the almonds are toasted. Remove immediately to a sheet of parchment paper to cool. In a small jar or container with a tight fitting lid, combine the vinegar, 2 tablespoons olive oil, mustard and garlic. Season to taste with salt and pepper. Tighten the lid and shake until combined. Cut the goat cheese into 8 rounds. (I stuck mine in the freezer for about 5 minutes to make slicing easier.) Place the egg white in a small bowl. Combine the bread crumbs and rosemary in another shallow bowl or plate. Dip each of the goat cheese rounds into the egg, then into the bread crumbs. Press the crumbs into the cheese to make sure they are completely coated. Heat the 1 tablespoon of olive oil in a small skillet over medium heat. Place the goat cheese rounds in the hot oil and allow to cook until browned on both sides, about 1 minute on each side. Arrange the greens on a serving platter. Top with the peaches and cherries, then sprinkle the sugared almonds over the top. Place the fried goat cheese on top, then drizzle with the dressing. Serve immediately.